The twerk heard around the world. Twerk it, Make it, Do it, Makes Us. There was also an incident where the star of Disney’s Hannah Montana, Miley Cyrus, twerked all over the crotch of douche-dude-de-jour Robin Thicke to her latest single aptly labelled “We won’t stop” and stop she didn’t as she displayed the phenomenal length of her tongue arbidly and hilariously at regular intervals of the 12 minute performance. As the internet is wont to, it exploded in anger over the performance. “It was like she was having a seizure on stage….” It offended people that in song where the lyrics are “This is our house, This is our rules, And we can’t stop, And we won’t stop” that was doing EXACTLY what she was singing. The anger raged from people calling it offensive (to who? Teddy Bears, Tongues, asses, who? ), to Robin Thicke’s mother commenting that she felt embarrassed for her son during the performance (“embarrassment” that was conspicuously absent during EVERY viewing of the “Blurred Lines” video for some reason?). A widely circulated comment on Facebook decided to offer advice to Billy Ray Cyrus “Dad to Dad.” Yes, coz all children are the same. Just like the wonderful unique flower child that you are bringing up. She’s 20. She’s doing on a MUCH larger scale, what your kid is ALREADY doing. 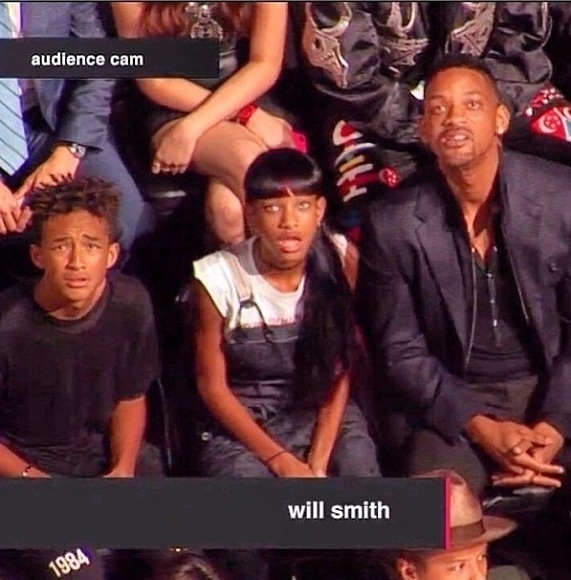 This photo of the Smith was widely circulated as a response to Miley’s performance. But this turned out to be a pose that the family had struck that pose when they saw Lady Gaga’s equally outrageous performance at the same event. Already, Cyrus is laughing her way to the bank after what is now the most outrageous performance in the history of the MTV Video Music Awards. A skinny, white woman singing about partying non stop is something that has NEVER happened on the VMA stage apparently. It also hurts me to imagine that they would reduce the most iconic moment in pop music history (the Madonna-Britney fluid swap) to #2 on the list. Watch Miley Cyrus at the 2013 MTV VMA’s here. It was out there, bizarre and slightly ridiculous. But it was nothing we haven’t seen before. You keep going Miley. No one is stopping you.